Ardentryst is a really fun open source game made with python, and pygame. What stands out are the goodness of the graphics, music and sound. With the feel of the control you have of the characters being another highlight. 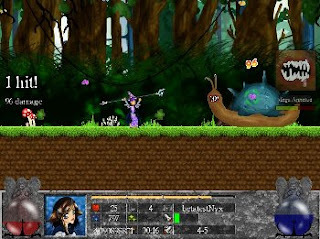 It's a platformer/RPG type of game, and there are a bunch of different combo moves you can make as your characters in the game gain more experience. Think tapping different buttons at the right time to do special moves. You run, and jump across things in the levels destroying baddies as you go. Currently you can choose from two characters in the game. One is a male warrior, and the other a female wizzard. The feel of the characters seems quite different. Each one gets different abilities, weapons, and spells. Plague is a game I've been playing for a while now... downloading a new version each time its author Benedict Carter does a new release. It's not a finished game, the author still has lots of plans for its future, but it is quite playable and fun. It's an overhead game, which limits your line of site on a very large map. You play in a team of survivors against zombies! It has randomly generated maps, so each game is slightly different. You need to run around to try and kill all of the zombies, and zombie hives(which create new zombies). You start off with no weapon, amongst a group of other survivors. All of you run off trying to grab weapons and ammo (which are conveniently lying around), as the zombies move in to try and eat your brains. There's a selection of weapons, from a pistol, to a mini gun... as well as different grenade types. Which you can use to burn things -- trees, zombies, or even your self. pygame -- better OSX support, midi virtual keyboard example, basic camera module on windows, imports in ironpython (the .NET/C# python). Brian has removed the dependency pygame had on pyobjc. This is important because pyobjc has become not well enough maintained for pygame. It is part of the apple supplied python, but not other versions of python commonly used on OSX. We had to make a binary of it ourselves for the last release -- because there wasn't one supplied by the maintainers. The midi module also works on OSX now... to go with the linux, and windows support. The above automatic builds also include the midi stuff for windows/mac. So you can attach midi devices (like keyboards, drums, guitars, synths etc) and use them to control your game (or robots).